Rarely seen at sea, the Galapagos fur seal rests in the shade along the rocky coastline during the day, and hunts in the Marine Reserve at night. Galapagos fur seals are typically found on the rocky shores of the western islands of the Galapagos Archipelago. They are endemic to the Islands and due to their decreasing population size, they are classed as endangered by the IUCN. They are the smallest in the family of otariids (the eared seals), and have a grayish-brown fur coat. The adult males of the species average 1.5 m in length and 64 kg in mass. The females are smaller averaging 1.2 m in length and 28 kg in mass. They are very similar in appearance to the Galapagos sea lion, however there are some key differences for telling them apart. Fur seals are generally smaller with broader and shorter heads. The fur seals have bulging eyes and ears that protrude more than sea lions’, and larger front flippers that aid in climbing rockier ground. The biggest difference is probably in their coat, which is much thicker than that of the sea lions. It is often thought that the Galapagos fur seal is much less abundant than the Galapagos sea lion, but their population numbers are actually fairly similar. They are just less likely to be seen by visitors as they prefer rockier, shaded areas, which are less likely to be frequented by tourists. Galapagos fur seals have large eyes so that they can hunt at night and still keep a look out for predators such as sharks. They tend to dive to between 10m and 50m, although they are capable of diving to much deeper depths. They feed primarily on fish and cephalopods, relatively close to shore and primarily at night as their prey is much easier to catch then. Research has shown that they tend to hunt less when the moon is full, probably because they become more visible to sharks and their prey tends to move into deeper waters. Galapagos fur seals live in large colonies which are divided into territories by the female seals during breeding season (mid-August to mid-November). 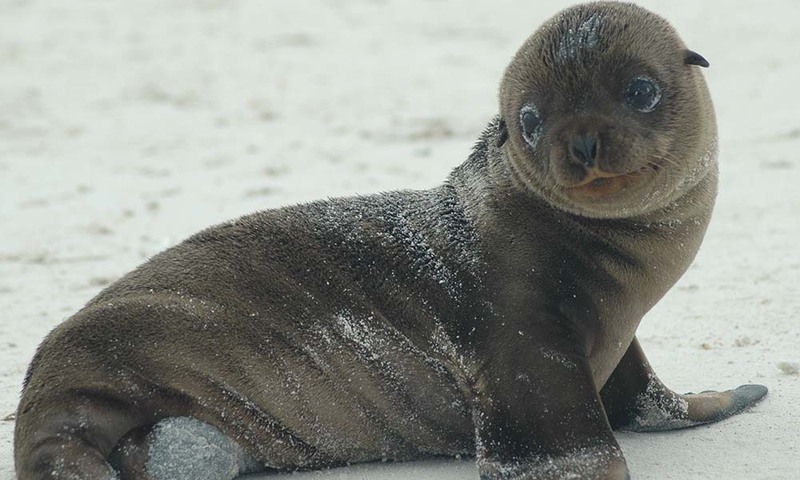 Every mother seal claims a territory for herself and breeds her pup there. The Galapagos fur seal has the lowest reproductive rate reported in all seals with the females only bearing one pup at a time. She remains with her newborn for a week before leaving to feed, then periodically returning to suckle the pup for a few days before leaving on another hunting trip. Females recognize their own pups by smell and sound, and pups also learn to identify their mothers by the females’ pup attraction calls. Mother-pup recognition is crucial because females exclusively nurse their own pups, often violently rejecting strange pups that approach. 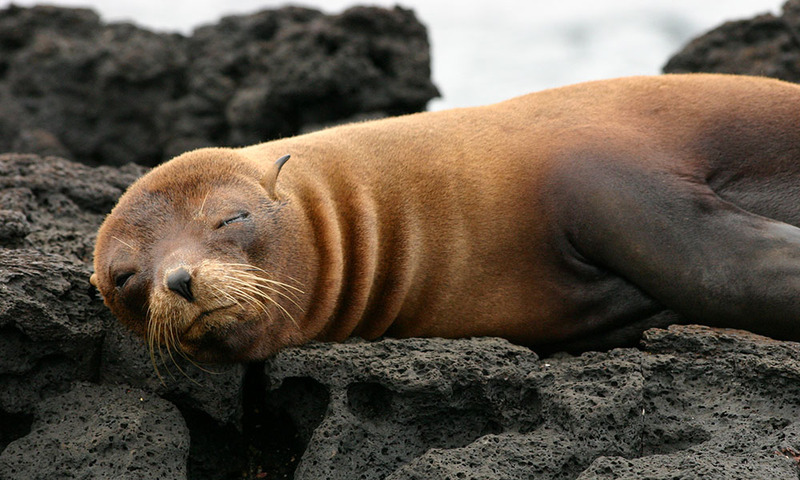 Where to see them: Galapagos fur seals occur on nearly all of the islands in the Archipelago. They can be seen most easily by tourists at James Bay on Santiago and in Darwin Bay on Genovesa. When to see them: Galapagos fur seals can be seen all year round. The best time to see pups is during October. Threats: Galapagos fur seals are particularly affected by El Niño. The warming of the ocean reduces the food availability for the seals, causing starvation. During the 1982-1983 El Niño event almost all young fur seals were lost along with about 30% of adult females and non-territorial males and almost 100% of the large territorial males. Additionally, the spread of feral dogs on the Galapagos Islands may jeopardise the future of some of the fur seal colonies. They are also threatened by marine plastic pollution. Conservation action: They are fully protected under Ecuadorian Law after they were hunted to near extinction for their fur by humans in the early 20th century. Hunting was prohibited in 1934 and additional protection was provided in 1959, when the National Park was established. Currently, we are working with partners to assess the risk of marine plastic pollution to marine wildlife as part of our Plastic Pollution Free Galapagos programme. Help us to protect Galapagos fur seals today by donating to our Plastic Pollution Free Galapagos programme! Having trouble telling your Galapagos fur seal from your Galapagos sea lion? Discovering El Niño 2015: What is El Niño?